Denise Rushing's journey is a unique blend of science and spirit. Born a sensitive child with a scientific mind, Denise found the natural world enchanting… and grew concerned over the fate of the planet at an early age. As a young adult, she devoted her talents and energies to environmental and technical solutions, earning a degree in environmental engineering from Stanford University and furthering clean technology through her pioneering work in the energy industry. Her business success notwithstanding, Ms. Rushing recognized that humanity’s relationship with Earth’s living systems required a deeper response. 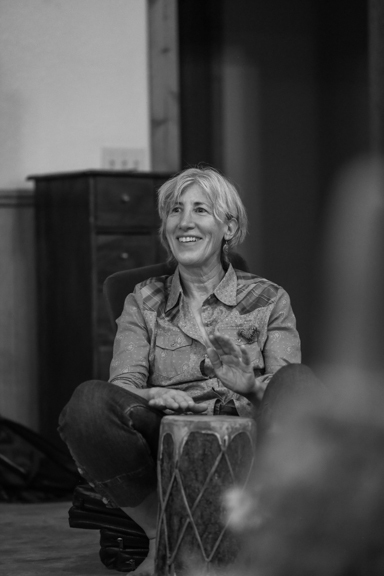 In 2003, after earning her Master's Degree in Culture and Spirituality from Holy Names University, she co-founded Rockhaven Ecozoic Center and later founded Dancing TreePeople Organic Farm, where she developed programs that transform the human inner landscape, and applied ecological design to human systems. She recently authored the Book: Tending the Soul’s Garden: Permaculture As a Way forward in Difficult Times—a deeply practical guide to engaging in difficult work with balance, hope and purpose. A recent milestone in her journey was her election to public office in 2006, unseating an incumbent after living in her Lake County community only 18 months. She was swept into office with one of the most transformative elections in the Lake County history. Her platform was one of justice and environmental stewardship, with a message that resonated with the deeper dreams for her rural community. Her decision to run came about after applying ecological design principles to the “living system” of Lake County governance. In her campaign, Denise advocated for the renewal of the land, the watershed, and communities and spoke for future generations. It is here she created her inspirational systems for activating changemakers. Lake County’s community and cultural transformation is a testament to her approach: the community won the California’s Green Summit Environmental Leadership Award two years in a row with both “high tech” projects, such as the largest public solar installation in the western united states, to “appropriate tech”—local park structures constructed with volunteer labor and with all local and natural materials. Her community legacy includes a vibrant Transition, local food and permaculture movements and her systems continue to empower individuals to make a difference. Denise is passionate about our human capacity to create a just and sustainable world. She sees entrepreneurial energy as a promising, transformative force in the economy as well as within the human heart. Those who engage with Denise feel energized and empowered, knowing that their efforts matter and that, by doing what calls them, they too can make a difference. Clients say she bridges head and heart, and offers a practical, yet deeply centering way to engage and move forward with focus, clarity and ease. Denise lives, works and writes at Dancing TreePeople Farm Community in Upper Lake, California.